Khalid Bin Kalban, André Sayegh and Colin Fraser. 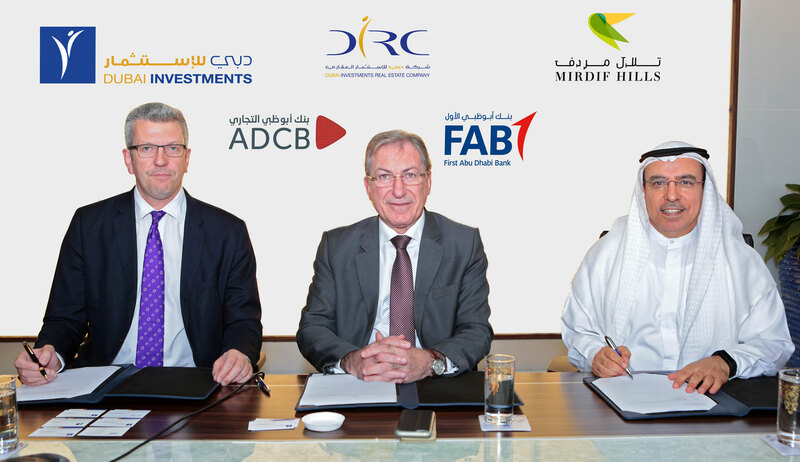 Dubai: Dubai Investments Real Estate Company LLC [DIRC] has signed an AED 1.1 billion financing deal with First Abu Dhabi Bank [FAB] and Abu Dhabi Commercial Bank [ADCB] for its much-anticipated Mirdif Hills development. Mirdif Hills is being developed by DIRC – the real estate development arm of Dubai Investments PJSC, the leading, diversified investments conglomerate listed on the Dubai Financial Market. The project financing was arranged as a club deal by FAB and ADCB. FAB acts as a Sole Coordinator, Joint Mandated Lead Arranger, Book runner, Issuing Bank and Account Bank. ADCB acts as a facility agent and security agent on the ‘Mirdif Hills’ project financing. The deal was signed by Khalid Bin Kalban, Managing Director & CEO of Dubai Investments and Chairman of DIRC, André Sayegh, Deputy Group CEO of FAB, and Colin Fraser, Head of Wholesale Banking at ADCB. Mirdif Hills, which is being constructed in phases with a project cost in excess of AED 3 billion, is currently the only freehold development situated in the Mirdif area. It is located adjacent to Mushrif Park and also is in close proximity to Dubai International Airport. Mirdif Hills is being launched in clusters and will be replete with all lifestyle attractions and wide array of commercial and retail outlets, community recreation and landscaped areas in a gated environment. FAB, the UAE’s largest bank and one of the world’s largest financial institution offers an extensive range of tailor-made solutions, and products and services, to provide a customised experience. Through its strategic offerings, it looks to meet the banking needs of customers across the world via its market-leading Corporate and Investment Banking and Personal Banking franchises. Based on pro-forma financial information as at June-end 2017, FAB had total assets of AED 625 Billion (USD 170 Billion). FAB is rated Aa3/AA-/AA- by Moody’s, S&P and Fitch respectively, the strongest combined ratings of any bank in the MENA region. Through a strong, diversified balance sheet, leading efficiency and a solid corporate governance structure in place, FAB is set to drive growth forward. Abu Dhabi Commercial Bank [ADCB] was formed in 1985 and as at 30 June 2017 employed over 4,500 people from 78 nationalities, serving retail customers and corporate clients in 48 branches, 3 pay offices and 2 branches in India, 1 branch in Jersey and representative offices in London and Singapore. As at 30 June 2017, ADCB’s total assets were AED 259 billion.